FORESTRY COMMISSION FOUND GUILTY OF SPREADING DISINFORMATION ABOUT WILD BOAR IN THE FOREST OF DEAN - IN A REPORT FUNDED BY THE FORESTRY COMMISSION! 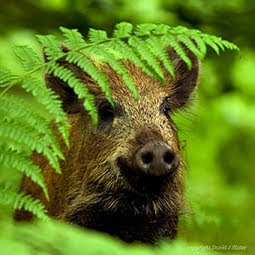 The results of an unpublished survey, commissioned by the Forestry Commission themselves, has been released on the social aspects of wild boar in the Forest of Dean. The authors of the Commission's survey, Dutton, Clayton and Evans represent the Institute of Science and the Environment , University of Worcester. 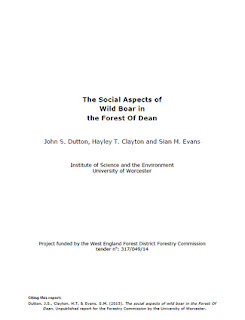 The report does not say anything about the author's credentials, but we do know that Clayton, whilst undertaking her PhD at Worcester, was employed by the Forestry Commission at Bank House for a number of years. Therefore, before considering this report, we must recognise that it is biased, having been undertaken and paid for by the Forestry Commission and it's employees. 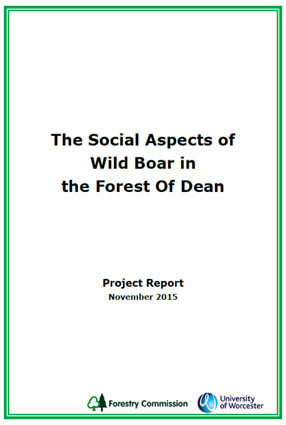 The report is ostensibly about the results of a social survey allowing residents of the Forest of Dean to answer questions and give their opinions and experiences of what it is like to live alongside wild boar. Given that the authors failed to challenge or clarify the opinions given, both negative and positive results should be taken with a pinch of salt. People lie! People get things wrong! We shall return later to these opinions, but lets start with the history given in the report to check on the accuracy of what IS known. The first chapter (5 pages) covers the background to the boar in the Forest of Dean. It correctly states that wild boar have been roaming at Chase and Penyard Hills since 1999 (about 1 mile from the Forest of Dean). It then makes some interesting comments, that although in themselves are unsurprising, it is what is omitted that highlights a few secrets the Commission do not want you to know. "Further animals were illegally dumped at Staunton in November 2004 (Figure 1.1). This was reported as 40 animals by Defra (2008) but actually involved 60 individuals. Initially these two populations were made up of relatively tame animals; there are numerous tales of people hand feeding the boar. It has been reported anecdotally that on at least one occasion the boar were rounded-up with an opportunity for their capture." The authors are very sure that the number of boar released was not 40 but 60! No proof given. The story of how many boar were released near Staunton in November 2004 seems to have morphed over the years. Very early press reports put the figure at 10-12 boar. This soon became raised to 25-30 boar (Wilson, Wildl. Biol. Pract., 2014 March 10(3): 1-6), but in the Forestry Commission's own Management Plan of 2011, this inexplicably (and without evidence) became 60 boar. How do the Forestry Commission know it was 60???????? 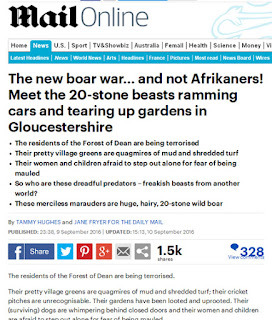 Maybe it was they whom released the boar? Let's ask a wildlife ranger, Neil Sollis, who in 2006 was interviewed by freelance journalist Angus Watson. 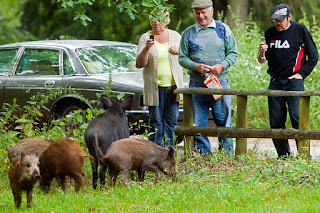 In this article, Neil Sollis talks of the two groups of boar, "We’ve no idea where the two groups of boar in Dean, about 60 all told, are from, although we do know that they’re pure wild boar." So, 60 boar were NOT released at Staunton after all. This is the estimate in 2006 for all the boar from both groups. So how many escaped from the boar farm at Ross-on-Wye? We are finding it difficult to find this out, but someone must know - the farmer probably? Any other clues? OH YES. The strange comment above, in our Dutton report that anecdotally, people were feeding and trying to capture the boar initially, is tremendously insightful to us. Friends of the Boar have known for many years that two large projects were undertaken on the Ross-on-Wye Boar between 1999 and May 2005. 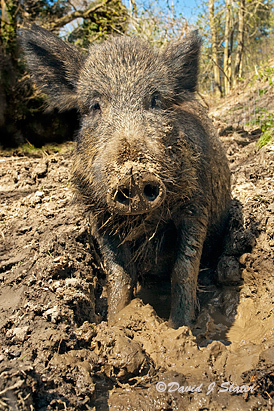 The study from 1999 - March 2004 included feeding and trapping of boar in Kent, Dorset and Ross-on-Wye. 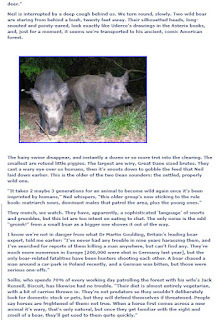 The 1st May 2004 - 30th April 2005 study consisted of feeding and trapping boar in only Ross-on-Wye. The Forestry Commission at Bank House in Coleford were employed to undertake this trapping experiment. In the article cited above, written about Neil Sollis in 2006, we read about the 60 boar, "They cast a wary eye over us humans, then it’s snouts down to gobble the feed that Neil laid down earlier". 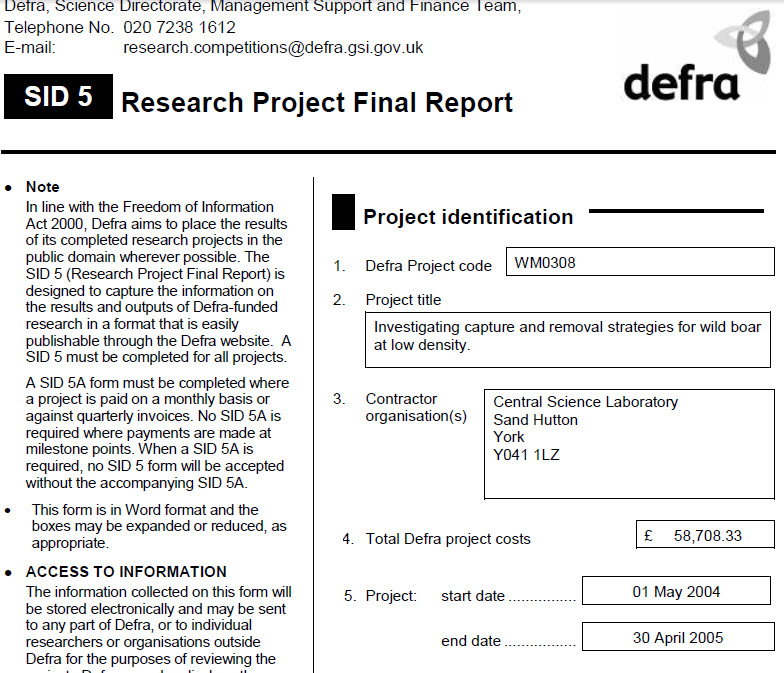 And now you will discover that the 2 Defra projects used HUGE amounts of maize to trap the boar over 5 years! So NO, it is not anecdotal that people were feeding these early introductions of boar - DEFRA and The Forestry Commission were feeding them copious volumes of food!!!!! Which, incidentally, they still do. It is not the public feeding the boar but the Forestry Commission's hunters! And what of the trapped boar, how many, and what were the ages of the trappees? Of the earlier study, "In total 31 wild boar (18 males and 13 females) were trapped and tagged, a further 13 animals (some probably recaptures) were trapped and released without fitting tags. Of the 31 animals which were anaesthetised, all appeared to be in good condition and 27 (87%) of the animals were juveniles (6-12 months old). The other 13% (n = 4) were three older females and one male in his second year (Figure 2). The largest trapped animal was 92kg compared to a range of 40-52 kg for the 27 juvenile animals. No fully adult males were trapped". Of the later study at Ross-on-Wye, "Over the entire study, a total of 28 captures were achieved, composed of 20 individuals and 8 recaptures. The overall trapping rate was 7.3 trap-nights per capture. During Summer 2004 and Spring 2005, 40% and 58% of the estimated minimum population were captured respectively. Trapping preferentially captured young animals in the population. In Summer, juveniles represented 100% of the captured population but only 75% of the estimated minimum population. In Spring, juveniles comprised 86% of captured animals but only 67-73% of the estimated minimum population". Anyone good at maths? 31 + 28 = 59. Mostly juveniles! And guess the age range of the boar seen around Staunton JUST AS THESE PROJECTS WERE FOLDING UP around November 2004? Yep, Juveniles. Please send this information to your favourite newspaper! 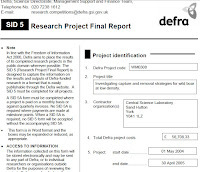 The report has yet another deception in its early Chapter too. Page 4: "Frantz et al. (2012) found that boar from the Forest of Dean differed genetically from both continental wild individuals and domestic pigs, indicating that this population had a mixed wild boar/domestic pig ancestry". Although Frantz et al (co-author Massey works for Central Science Labs, part of the Forestry Commission quango) does indeed find domestic pig ancestry in 20 sampled wild boar from the Forest, he also shows how every single boar across Europe also carries the same ancestry! The paper highlights that although the Forest of Dean boar have some unique markers that set themselves apart from boar on the continent, the differences are insignificant and far removed from the genetics of domestic pigs. The Forest of Dean boar, as concluded by ranger Neil Sollis and other experts, are as pure a wild boar as those across Europe are. The rest of the information in the report, therefore, CANNOT BE TRUSTED simply because the authors can't even get the historical facts correct, and they use purposefully misleading language. 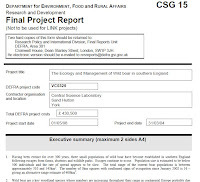 But this is what you would expect of a report funded by the Forestry Commission about wild boar. We get unproven comments about costs of hunting from personal communications between Clayton and Stannard - presumably over their lunch break cuppa. Similarly, we get inaccurate costs of boar damage, including high costs to repair fences that were not even damaged by boar. The authors note that many of the respondents say they know about boar, only to contradict themselves elsewhere in the questionnaire. Respondents claiming boar attacks are obviously mistaken over what a boar attack is. A boar can easily outrun a human. If a boar runs at you to attack, it will get you! So no. Most "attacks" are of inquisitive boar trotting towards a dog or human for a closer look. Most people misinterpret this as an charge! Some attacks are mock attacks, but these are minor incidents, usually when piglets are near mothers. This is not helped by Dutton et al quoting a spurious report of Mayer, J.J. (2013). Wild pig attacks on humans. Proceedings of the 15th Wildlife Damage Conference: 17-35. In this report, Mayer claims 665 attacks have been made by wild boar on humans across the world. But Mayer defines attack as a "perceived threat" y the human, or as a "close encounter". Mayer gives no examples of any human actually being attacked in what would be the colloquial meaning of the word! Using Mayer is to scare the reader into believing wild boar actually attack people, when in fact they do not. This is clear propaganda and scaremongering by the Forestry Commission who paid for this report. But remarkably, given the biased nature of the report, what we discover in it's conclusion is a heavy criticism of the Forestry Commission. 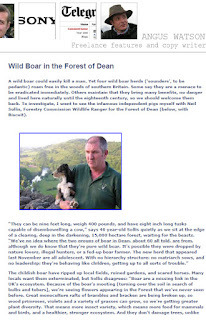 There are, without doubt, significant impacts on the residents of the Forest of Dean by the presence and activity of wild boar. However, the significance of these varies widely, and can be both negative and positive. Perhaps the main issue identified by this project is the lack of satisfaction with the provision of information on wild boar. This is highlighted by the results of the questionnaire but also came across strongly when the project team spoke to residents, business proprietors, etc. 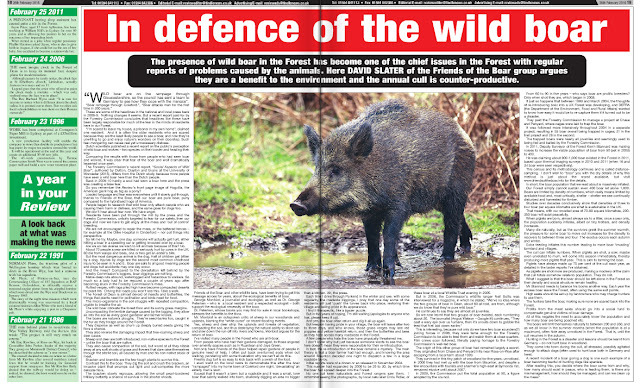 There was extreme dissatisfaction with the Forestry Commission and District Council with what was felt to be poor and/or a lack of communication that exacerbates the frustration experienced by the negative impacts of boar. It is also unclear to many why the District Council abdicates any responsibility for providing information and the management of boar and passes all enquiries, etc., to the Forestry Commission. This reflects the situation recorded in the Netherlands. Dissatisfaction is increased with what is perceived as misinformation and disinformation. Much of this maybe more as a result of what is seen as a lack of provision of information. However, incidents such as the misrepresentation of the minimum numbers calculated by thermal imaging as actual numbers is unhelpful. Local media, especially the local newspapers, are also culpable in perpetuating some of the issues, such as anxiety and fear, with sensationalistic reports that frequently contradict one another. Mayer (2013) also reported that the media were quick to highlight the attacks and the threat of attacks; the English media were mentioned in particular to be sensationalistic. Clayton & Dutton (in prep) reviewed media articles in 2010 and found both national and local media were sensationalistic, with few reports being neutral in nature. Greater awareness and more accurate, clear and detailed information on the risks and benefits would be invaluable in managing the expectations, fears and issues of residents. Better information and education on adapting behaviour, expectations of individual responsibility, etc., would allow many to overcome any concerns regarding the presence of boar. 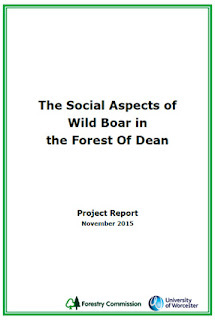 It is not the remit of this report to comment on the management of wild boar in the Forest of Dean. 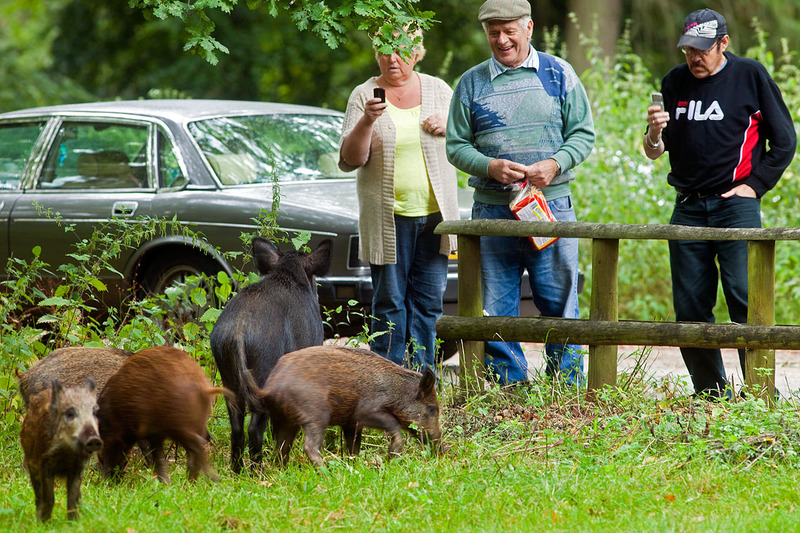 However, the lessons from Baden-Württemberg and other European countries would indicate that tough decisions are required to ensure the boar within the area do not become more of an issue to resident communities (and visitors). In particular in respect to negative boar-people incidents, boar-vehicle collisions, impacts on amenity areas, etc., although other negative impacts should not be discarded as unimportant. 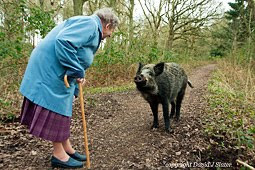 A sustainable (in financial/resource terms) population management strategy that is acceptable to residents and external stakeholders and communicated would seem to be an essential requirement for the management of boar and the expectations of resident communities. However, as can be seen from the crude calculations from data provided by the Forestry Commission, currently the financial costs of wild boar management seriously outweigh any economic benefits.